Pen Cases - What do you use? As my pen addiction grows and grows, my storage space for pens gets tighter and tighter. For pens I don't use much or have fallen out of favor with, I send them to Pens For Kids. But what about the ones that I keep handy for regular use? Two of the pen cases I am using right now are the Kokuyo NeoCritz Transformer (Top Left) and the John & Mary Pouch. These are the pens that go to work with me every day, not to mention the additional pens in my backpack pockets. The Kokuyo case holds most, if not all, of my Pilot Hi-Tec-C pens, and the John & Mark cases hold my Uni-Ball Signo DX's in one, and drawing type pens (Copic, Sakura, etc.) in the other. I also keep a larger generic pen case at home that holds around 100 or so pens. I use this to keep most of the pens that I have reviewed, or like to use, but just not as frequently as the rest. 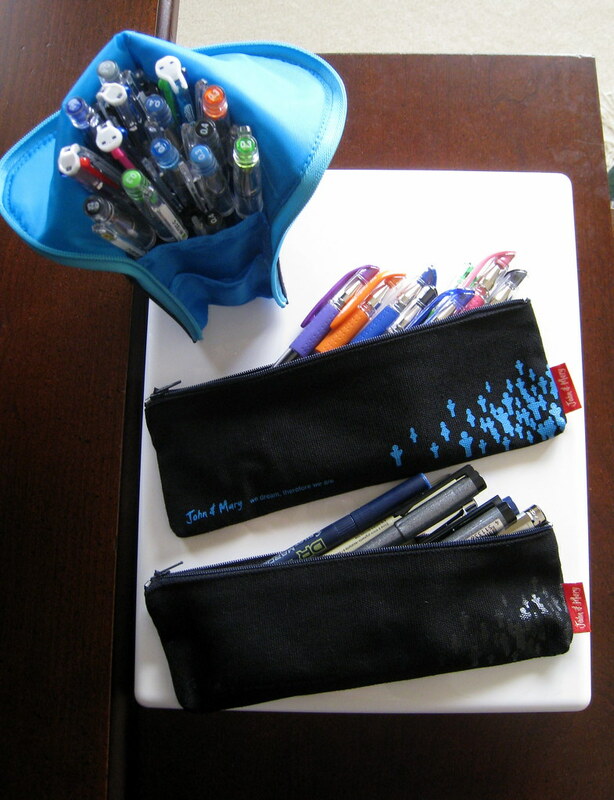 It allows me quick access without trudging through a drawer or box of loose pens. So, what kinds of pen or pencil cases do you use, or does another form of storage work better for you? Posted on November 12, 2008 by Brad Dowdy.